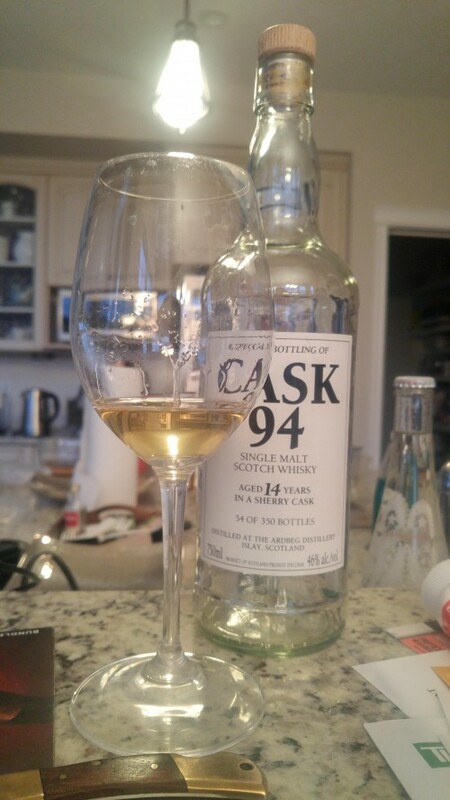 14 Year old Ardbeg... supposedly done in a sherry cask. That part of the label alone has me scratching my head - either it's some kind of white sherry that I didn't know existed, or it was an incredibly dead barrel that's been used so many times, that there's no sherry influence left to give. At least we can probably say it's natural color. The good part is that as far as Ardbeg is concerned, it was fairly affordable for an aged Ardbeg (125 CAD) I've been having conversations with some good friends who are Ardbeg diehards who claim it's understandable that Ardbeg wants to charge 800 CAD for their latest offerings of twenty something year olds. Maybe, to some, it is worth it, but frankly I do would like to stay married, and I would like my son to go to college some day, so unfortunately this 14 yr Ardbeg is going to have to be the oldest Ardbeg I'm going to have for the now. Nose: This just screams Ardbeg 10 - Big brash campfire, coastal seaside notes, salty seawater, and . Fresh grass. Where it differs from the 10 is there's also a fairly noticeable bit of butter which makes it feel richer, and maybe the barest traces of some sulphur (maybe from initial sherry cask charring?). Maybe. Truth be told, had someone told me this was done in a bourbon barrel, I'd have believed them. the sulphur from the sherry could be completely mental bias. I should review these things blind more often to see what I do think without the influence of the label. Finish: Lingers a decent amount in your mouth and no further, pleasant though, drying chardonnay characteristic, coupled with fresh grass. Spectacular? no. Enjoyable? Absolutely. Extremely interesting as IB Ardbegs appear to be extremely rare. 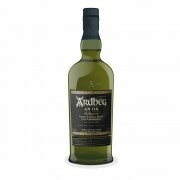 It shows how solid the base Ardbeg spirit is. That being said, I don't know that I'd buy this over the 10 - it's actually fairly similar to it, but the 10 can be had for around 60-70CAD around these parts. As for the cask - I can't believe it's not Bourbon! @Jonathan yessir they do have the marketing angle down. Makes me think they’re almost macallan esque at this point... but apparently saying that about an Islay distillery tends to rouse pitchforks. I would say that marketing successfully ≠ Macallan-esque. Ardbeg sure brands the hell out of their releases, but that's different from positioning yourself as the oligarch's malt of choice. Great review, strange to see an independent bottling of a brand that seems to keep every drop for itself. The twenty something 22 is being offered in the U.K. to committee members for £440 and honestly that seems a little crazy. The Twenty something 23 can still be bought for less here. Surprise, surprise this release has not sold out... just received a bottle from the springbank committee .... a 15yo for £65 ..... I know where I’d rather spend my money.